When we told people we were traveling to Sweden in March we were asked, “Isn’t it still cold there?” The answer was yes, it was cold. In fact, it was very cold where we were planning on going, because we were heading above the Arctic Circle to Swedish Lapland. There was a reason we were going to spend four nights in below freezing temperatures—the Northern Lights. Come hell or high-water, I was going to see and photograph the famous Northern Lights . . . if I was lucky. I was under no misapprehension that a Northern Lights sighting was guaranteed. I had been researching seeing and photographing the Northern Lights, including the recitations of fellow travel blogger Jennifer Dombrowski, Luxe Adventure Traveler, about her chase of the Northern Lights, especially her 5 Things No One Ever Tells You About the Northern Lights. I had found in my research that Swedish Lapland above the Arctic Circle was one of the best places in the world to see the Northern Lights, or Aurora Borealis. I was excited, but also worried that these spectacular auroras would pass before we got to Swedish Lapland. When we arrived in Jukkasjärvi I neurotically checked my Aurora Forecast app, an Aurora Service website with an hourly forecast, the Aurora Sky Station web cam, and the AccuWeather.com cloud forecast. Our first night in Jukkasjärvi, March 16, was supposed to have very low aurora levels, but according to the weather forecast that night was going to be the clearest night of our four nights in Swedish Lapland. This was also the day we were spending the night in an ICEHOTEL cold room. We sat in the dressing room of the ICEHOTEL, falling asleep occasionally and heading outside every half-hour in hopes of seeing some small glimmer of green light in the sky. It wasn’t until we had given up and were getting ready to head to our ice bed around 1:30 a.m. that I saw the tiniest bit of movement in the sky. It was barely anything, but it was my first ever sighting of the Northern Lights and I was worried that was all I was going to get. I was worried these were the only Northern Lights we would see. They're not much to write home about. 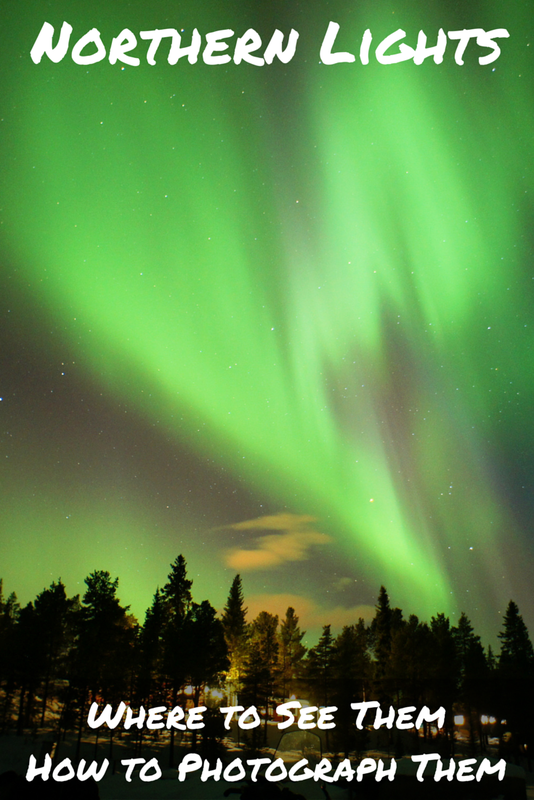 The next day, March 17, St. Patrick’s Day, Lights Over Lapland posted this announcement: "Aurora alert! A KP-6 geomagnetic storm is battering Earth's magnetosphere and will likely cause powerful auroras in northern locations." Lights Over Lapland runs Northern Lights photography tours where they provide cameras for guests which are already set up to capture the Northern Lights plus a professional photographer to ensure everyone gets the perfect shot. When planning our trip I had tried to schedule our tour with Lights Over Lapland on March 17, but had to book March 18 instead because they were full March 17. Looking at the weather, it was supposed to be completely cloudy where we would be that night, and I was sure by not getting on that tour we were going to miss the opportunity to see what might be the best light show of the year. Then the Facebook posts and tweets and emails started coming in from friends who were wondering if we were going to see the insane Northern Lights show that was all over the news because they were going to be visible in places like West Sweden, England, Michigan, Wisconsin, Washington, Illinois, New York, and even as far south as Texas and Georgia, places that almost never see the Northern Lights. With heavy hearts, we set out on our snowmobile aurora expedition that evening with Kiruna Guidetur. I had chosen that tour because I wanted to plan activities that would be fun even if the Northern Lights didn’t show themselves. Our guide Finn said he had been looking at the weather and it looked like the skies might actually clear up where we were heading. I figured he was just trying to instill some hope in us, but kept an anxious eye out just in case. We rode through silent darkness across the white snow illuminated only by the headlights from our snowmobiles. As we drove along I would see the occasional twinkle of a star in the sky, an indication that the clouds might actually be clearing up. About halfway to our destination Finn motioned for us to stop. Up in the sky, we could see what looked like a moving milky cloud. It was the Northern Lights! Even without a tripod, I was able to take my first real picture of the Northern Lights. I told Rome that if this was all we saw, we were lucky. Little did we know what would happen next. We would have been happy with just this glimpse of the Northern Lights. We continued on until we reached our destination on the frozen River Torne. While we set up our tripods, the other gentlemen on our tour, who hadn’t brought cameras, laid down on the frozen river and started singing broken-hearted love songs in Chinese at the top of their lungs towards the heavens. To be completely truthful, I was so anxious I got a little irritated with the singing at first, but then it was like the heavens responded to the singing and little by little the lights started to show themselves, first in pale pinks behind us, then stronger pinks and greens in front of us. It was like their singing had opened up the skies for us and I could have kissed each and every one of them (which probably would have been incredibly awkward). They continued to sing while Rome, Finn, and I frantically snapped pictures, repositioning our cameras to point towards different parts of the sky as the Northern Lights erupted all around us. Our Northern Lights show started with pink. We later learned that March 17, 2015, happened to be the best showing of Northern Lights in a decade, and possibly the best viewing conditions in even longer. Slate published the article Tonight Is Your Best Chance to See the Northern Lights in a Decade describing the rare press conference held by the National Oceanic and Atmospheric Administration’s Space Weather Prediction Center (SWPC) announcing a “severe geomagnetic storm” ranked as a G4, the second strongest of the rankings. (A stronger G4 storm occurred in August 2005, a month with only a few hours of darkness each night in the Arctic Circle.) The extreme storm was caused by two magnetic eruptions on the sun which sent charged particles to the earth’s magnetic field. The Aurora Borealis that night was so spectacular even people who lived in Swedish Lapland were amazed. Finn was snapping his own pictures, and when we returned to the ICEHOTEL late that night the bartender in the ICEBAR BY ICEHOTEL literally fell on the ground to take in the splendor of a second magnificent show. The Northern Lights moved and changed to shades of orange. The irony of it all is that if we had been able to book our tour that night with Lights Over Lapland, we would have missed the entire show. While Abisko is usually one of the best and clearest places on earth to witness the Northern Lights, that particular night it was completely covered in clouds. That night, and every day since then, we have felt like the luckiest people on the planet. So many things aligned for us to have the perfect night, but if circumstances had been different, we could have easily missed them. There is no guarantee that, even with the best planning, you will get to see the Northern Lights. So what can you do to at least up your chances of seeing the Northern Lights and stave off disappointment? First you have to decide where to go to see the Northern Lights. The Northern Lights can be seen in a number of places. In North America, Alaska and Canada are popular destinations. In Europe, Northern Scandinavia and Iceland are favored choices for aurora hunting. Norway, Sweden, and Finland have popular places in the north to see the Northern Lights. Our choice for this trip was Sweden. Abisko is known as the best place in Sweden for aurora sightings. There is little light pollution and its protected position, called “the blue hole over Abisko,” means more clear nights per season than other locations. Jukkasjärvi is also popular because it is the location of the ICEHOTEL, and the nearby town of Kiruna provides an urban base along with the chance of seeing the Aurora Borealis. This probably goes without saying, but the Northern Lights can only be seen when it is dark outside, so while there may be aurora activity during the summer, you aren’t going to be able to see it. In Swedish Lapland, the aurora season is October through March. We chose March because there are daylight hours, so we were also able to enjoy daytime outdoor activities in Swedish Lapland, and warmer temperatures (20 degrees Fahrenheit instead of -20). If we hadn't seen the Northern Lights, we still would have had fun snowmobiling. I cannot stress enough that there is no guarantee you will see the Northern Lights. We were very, very, very lucky to have two spectacular Northern Lights shows during our trip. But we also had two nights with almost nothing. Set aside a few nights to try to see the Northern Lights so you have more chances. Also, set up fun activities that will make your trip memorable even if you don’t get to see the Northern Lights. We went reindeer sledding, dog sledding, snowmobiling, and horseback riding, plus we stayed in the world-famous ICEHOTEL and explored the city of Kiruna and its mine. We would have been disappointed if we hadn’t seen the Northern Lights, but we still would have left Swedish Lapland with memories of once-in-a-lifetime experiences. The Northern Lights even look different on different cameras. Something that a lot of people don’t know is that the Northern Lights don’t look in person like they do in photographs. To the naked eye they many times look like a milky cloud with little color. When the Northern Lights were pink in our photographs, they were faint creamy wisps in the sky. When they are stronger green, then you can see the green in the sky, especially when they are dancing. Even though the gentlemen with us during our snowmobiling aurora tour were witnessing one of the most spectacular Northern Lights shows in over a decade, it was a bit lost on them because they didn’t see what we were seeing on our cameras. We kept showing them the pictures on our cameras so they could see what we were exclaiming over. Also, don’t expect to get the shots you’ve seen on the internet with your phone or point-and-shoot camera. Which brings us to . . . Mother Nature sent a heart for our broken-hearted companion. Now let’s get to the important part, how to photograph the Northern Lights, because let’s face it, in this digital age, if you didn’t capture it on film, did it really happen? Yes, of course it did, but it’s even better if you have what might be one of the most amazing experiences of your life memorexed so you can brag to all your friends. A decent camera with manual settings is essential for capturing the Northern Lights in photos. The other essential is a tripod. Perhaps not as essential, but right up there, is to bring two batteries. It is astonishing how quickly cold weather drains a battery. On our second night of auroras I had to change my battery halfway through the show. If you don’t have a tripod and good camera with manual settings and don’t want to invest in them, join a photo tour like Lights Over Lapland. These tours provide DSLR cameras and tripods for each guest and all you have to bring is a memory card. Also join a photo tour if you do have the right tools but don’t feel like you have the right knowledge of your camera to capture the Northern Lights. If you do have the essential tools for photographing the Northern Lights on your own, here are photo tips we gathered from our personal experiences. Set your camera’s focus to infinite, or focus on something as far away as possible. It is easy to forget this step in the excitement, but if you don’t set the focus, your photos will be blurry. Set your ISO to the lowest number that will still allow your image sensor to capture an image (see below for examples as this number can vary depending on the camera’s capabilities). The lower the ISO, the less graininess (noise) your photo will have. Set your f-stop to the lowest number possible. The smaller the number, the more light that is let into the lens, which provides a better picture with the shutter being open as short of a time as possible. Set your shutter speed for the optimal time based on the brightness of the Northern Lights. While you can pretty much leave your focus, ISO, and f-stop alone once set, the number of seconds you will keep your shutter open will change depending on the brightness. We used anywhere from eight to 30 seconds. This is why a tripod is essential. Use a wide-angle lens if possible. The more of the sky and landscape you can get into the picture, the better. Take off that lens filter. If you use a filter on your lens, you might come home, go through your pictures, and find that in the center of your beautiful Northern Lights photos there is a circular pattern that almost looks like a fingerprint. It has something to do with the spectral emissions of the aurora and the parallel faces of the filter and other scientific sounding words. Bottom line, lose the filter. Does anyone else see Bart Simpson? A mirrorless camera is the absolute best! If you’re not ready to jump onto the mirrorless camera bandwagon with me, DSLR is the way to go. Of course if you’re a professional photographer with lots of money, you’re probably packing something far more advanced than the cameras listed above (and are hopefully not terribly offended by my over-the-top endorsement of mirrorless cameras). The cameras I've listed are for travelers who want more than a point-and-shoot, but don’t necessarily have thousands of dollars to spend on cameras and equipment. One more tip for successfully photographing the Northern Lights is to practice ahead of time. We took photos in our backyard before getting on the plane to Sweden so we could figure out the optimal settings for our personal cameras in a nighttime situation. When the Northern Lights appeared, we were all set except for focusing and choosing the correct exposure time. Want a Northern Lights selfie? Very dim indirect light is the best. While out on the frozen Torne River, we tried using our phones to light up our faces, with results, but not the best results. We had the best luck when we were taking pictures of the auroras just outside our hotel in Kiruna, Camp Ripan, on our second night of amazing Northern Lights.. We stood in the adjacent park and let the indirect light from the hotel illuminate our faces. Be sure to stand as still as possible. If the Northern Lights don’t appear, you can use your camera skills to create fun light writing. When I told a friend about our experience and how, even after we had arrived home, I still found myself peering anxiously up into the night sky, she said that's what children do, and isn't that a wonderful thing to have that feeling back. She was right. The Northern Lights are such an awe-inspiring phenomenon they draw up that wonderment and excitement we had as children about the little things in life. They remind us there are things in this world that may be hard to understand and should just be enjoyed when we are lucky enough to witness them. Thank you to Lights Over Lapland and Kiruna Guidetur for hosting our Northern Lights tours and making this post possible. As always, all opinions are my own. Purchasing items through this article's affiliate links help fund our travels.